Regardless of what you call them - horned lizard, horny toad or horned frog - you probably don't see many of them these days. Once an almost ubiquitous part of the Texas landscape and psyche, the horny toad, as they are most commonly called, has been mighty hard to find for a long time. You might have some luck on the backroads and the backcountry of West Texas, but you're not going to find many - if any - in Central Texas. Blame pesticides, the loss of harvester ants (the toad's favorite fare) or the invasion of fire ants, but whatever the cause, horny toads are as scarce as cheap gasoline. Aside from the environmental aspects, the dramatic decline in horny toads represents a loss of part of Texas' heritage. The horned lizard is the official reptile of Texas, so ordained by the Texas Legislature in 1993. Few would call the horny toad beautiful, except maybe in a classic, reptilian sort of way. They're two-four inches long with a short snout, a flat body and a short tail. It's squinty-eyed and has a prominent crown of spines and two enlarged spines in center that look like horns. When threatened horny toads can puff up to twice their normal size. The spines have made it the final meal of many an unwitting snake. If anyone ever tries to dispel the myth that the Texas horned lizard can not squirt blood out of its eye, do not believe them. It can do this, and does. Some of us found this out the hard way, after years of blood-free relations with the critter. Other than that, they are perfectly harmless. A summer pastime of Texas children used to be gently stroking the horny toads soft underbelly until it went into a trance. We called it "horny toad hypnosis." The state of Texas and biologists call it the Texas horned lizard and most of the rest of us call it the horny toad, except on the campus of Texas Christian University in Fort Worth, which has as its mascot the Horned Frog. It's a horny toad is what it is. The Horned Frog designation at TCU has in the past caused a bit of consternation among the biologically correct, like Lawrence Curtis, a former director of the Fort Worth Zoo. Curtis crusaded to have the mascot changed to its proper name but TCU would have none of it. And does not try to crawl your pants up." "The Home of Old Rip"
It's perhaps a bit ironic that the horny toad has become a threatened species because the most famous story involving a horny toad concerns its incredible survival skills. Ol' Rip, the story goes, survived after being entombed in the cornerstone of the old Eastland County Courthouse for 31 years. 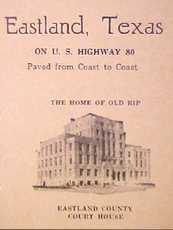 When the old courthouse was torn down to make way for a new one in 1928 Ol' Rip blinked a couple of times and eventually tried to scamper away. Even some people who saw the incident were skeptical. "I know it happened because I saw it," one observer said. "I know it didn't happen because it just doesn't make sense." "I do not know all the facts in the Eastland story," wrote professor Sam McInnis of Brownwood's Daniel Baker College. "From what I know about the story I think that it is true, because the frog was entombed in sand and rock, and it is possible for moisture and oxygen to pass through the rock and reach the frog, and sustain life for an indefinite period of time." The story got as much coverage, especially in Texas newspapers, as Charles Lindbergh's flight across the Atlantic Ocean. Ol' Rip became famous and went on a world tour with his own entourage. The strain of celebrity did what being entombed for 31 years did not - it killed him. Ol' Rip died of pneumonia while on tour in England. In another irony, Ol' Rip's celebrity might have helped lead to the demise of horny toads all over Texas and the Southwest. For a time, Texas children collected horny toads, sold and traded them, much like baseball cards. Thousands were bought and sold as pets and souvenirs. None of them lived nearly as long as Ol' Rip; most died in captivity. Numbers dwindled. Then along came fire ants, and the pesticides manufactured to wipe them out. The fire ants are still here but the harvester ants on which the horny toads depended are mostly gone. But not forgotten.